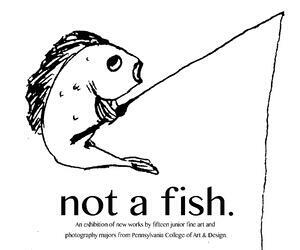 Pennsylvania College of Art & Design juniors from the fine art and photography departments present Not a Fish, an exhibition of recent works on display at Lancaster Art Studios, 411 W. King Street, Lancaster. A reception will be held Friday, April 6 from 5:00 p.m. to 8:00 p.m., and is free and open to the public. In preparation for the exhibition, student-artists developed individual projects based on their studies of contemporary artistic practices, with an emphasis on experimentation with new media, materials and processes. Participating artists are Kay Baier, Justin Carney, Jose Collantes, Lexie Downs, Brigitte Errickson, Dylan High, Ally Martin, Shealyn Oto, Sara Otto, Larissa Ramey, Michaela Robertson, Amanda Scudner, Connor Stillman, Melanie Vera, and Shyanne Wilson.